Tweet The long-awaited tour of two of the biggest names in metal will be heading out together for the first time ever. Twins of Evil tour featuring Marilyn Manson and Rob Zombie kicks off September 28th. Long time Zombie guitarist, John 5, stopped by to talk about the tour. You currently are Rob Zombie's guitar player. But you also used to play with Marilyn Manson. Will fans see a John 5/Marilyn Manson reunion on stage? No, no, no. I'm Zombie 24 hours a day. That's what I am and that's what I'll be as long as Rob will have me. When I'm in a band I'm committed. I know a lot of people would like to see it but… I'm a zombie. This just seems like a tour that should've happened a long time ago. How did it finally come together? I'll be honest with you. In this day and age, where we are with touring bands, there are not a lot of bands to tour with. People love packaged tours, which I do myself. If I were a kid and I was going to see a show, if you could get a bunch of bands together, that would be great. But there are only so many bands out there that are touring. Marilyn Manson and Rob Zombie are such a perfect fit; I'm just shocked that if didn't happen sooner. You and Rob Zombie seem to have great chemistry. How is playing with Rob Zombie different than playing with Marilyn Manson? They're definitely two different animals. Playing with Manson, you never knew what was going to happen. I guess that's the best way to describe it. But with Rob, it's like, 'Here's what we're going to do. We're going to do this at this time, do this at that time.' Everything is just very organized. He's the greatest guy to work with. I've been in the band for seven years now and I wouldn't have it any other way. 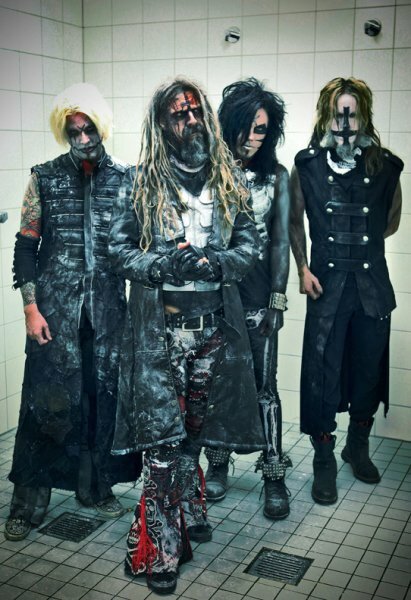 Rob Zombie has a new album coming out late this year. What can fans expect from this album? It reminds me of White Zombie because I was a huge fan of White Zombie. From a fan outlook, it's like early White Zombie. It's very aggressive, raw, in your face, it's, oh God, I can't wait for people to hear it. It's going to blow minds, that's for sure. Will any songs off Zombie's new album make the set on this co-headlining tour? No. You know what, we were talking about it. I don't think so. Your new solo album, "God Told Me To," is now out. With your Rob Zombie schedule, how often do you get the chance to play these songs live? Almost never because we are so busy. I put this album out for the fans, the guitar lovers, people like that. They really enjoy it. This time I put a DVD with it that shows me playing the songs in the studio. People really get their money's worth buying this CD; there's an hour long DVD with it chalked full of cool stuff. You also got the chance to score Zombie's new film, "The Lords of Salem." How is the process of scoring a film different than writing music? It's completely different; totally unconventional. I'm using all of these crazy instruments like a violin bow over guitars. There are a lot of violent cellos, oboes, French horns. Beautiful pieces of music but sometimes there will be ambient noise where there's no key signature at all. It was one of the most challenging things I've done in my career because I don't do it all the time.